I decided to once again join the Sewing Blue Blog Tour; which if you recall, is all about sewing for boys. 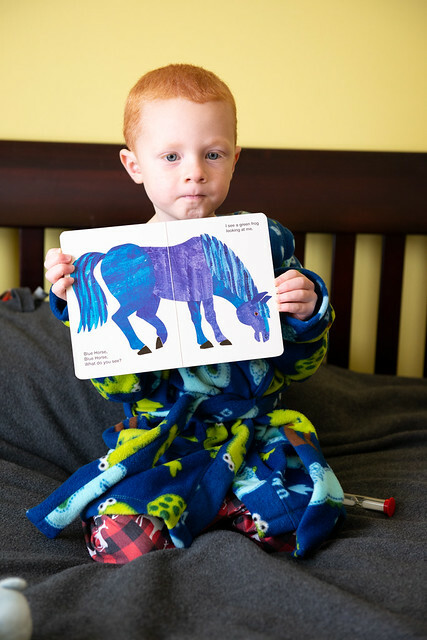 This time it’s the Boys in Pajamas tour organized by Made for Little Gents and sponsored by Peek-A-Boo Pattern Shop. As you have probably gathered by now from reading my posts, I really like Peek-A-Boo patterns. They have so many basic patterns for both boys and girls, which is nice since I have one of each. Be sure to enter the giveaway at the end of this post for your chance to win a $20 credit to Peek-A-Boo Pattern Shop. Don’t forget, they also sell fabric and not just patterns! For the pajama tour, I decided to branch out from my normal Alex and Anna Winter PJs (other posts are winter pajamas and some Christmas jammies), and made the Comfy Cozy Robe instead (I received the pattern for free since Peek-A-Boo was sponsoring the tour). 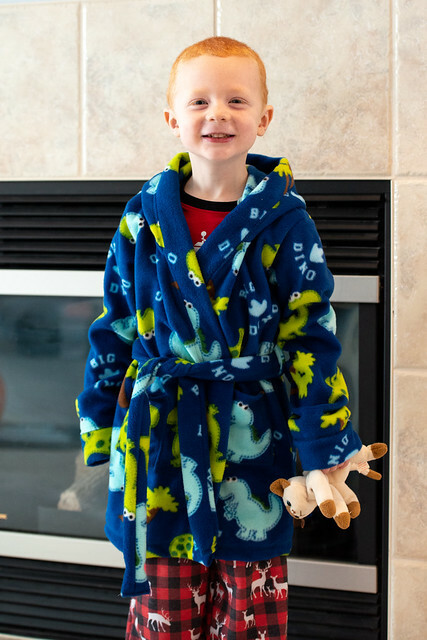 This is the first time I have made this pattern and both kids love the robe. 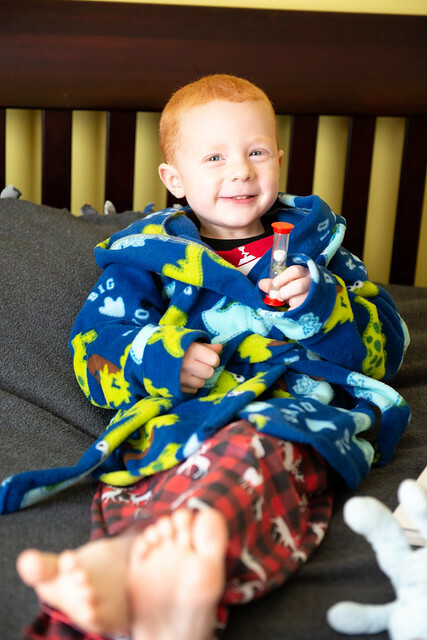 So far, Owen has worn the robe around the house just to keep warm, as well as after his bath. I think he had fun wearing it for the pictures and kept wanting me to take pictures of each page of his book. 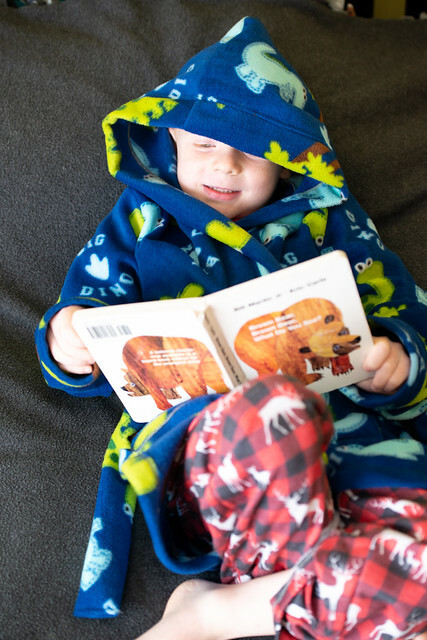 So we have a lot of pictures where you can’t see his robe, but you can see the pages of Brown Bear. As with other Peek-A-Boo patterns, this one was pretty easy to follow and sew. The only confusing part was with attaching the hood. I felt like if I took the normal seam allowance, that attaching the binding would then be off, so I just sewed the hood on with a minimal seam allowance and then attached the binding and it worked out just fine. The other difficult part was attaching the pockets. The thickness of the fleece caused the pressure foot to sort of push the whole pocket. So I ended up using wash away wonder tape to attach and then sewed them on. This way, they pretty much stuck where they needed to be with minimal shifting. 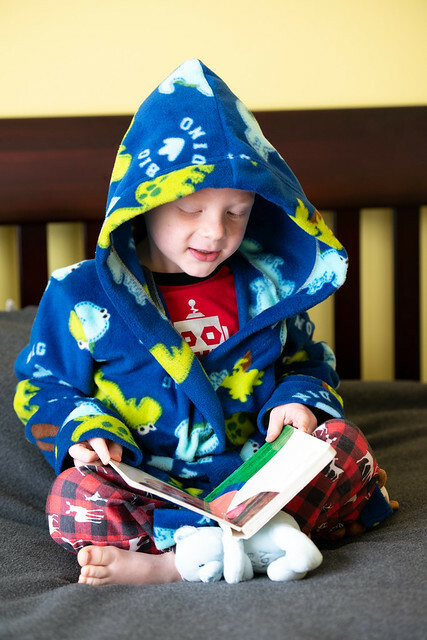 I also made Owen the Pajama Party Pants which is a free pattern if you sign up for the Peek-A-Boo newsletter or join their Facebook group. It’s a gender neutral pajama pant pattern. I made Lillian a pair a while back, but this is the first pair that I have made for Owen. They are slightly baggier than I would like, but I decided to make a straight size 4 instead of grading for his measurements. Note to self, don’t be lazy when making clothes, even if they are pajamas!! Disclaimer: I am an affiliate of Peek-A-Boo Pattern Shop and Amazon so I get compensated for any orders placed through the links in this post. 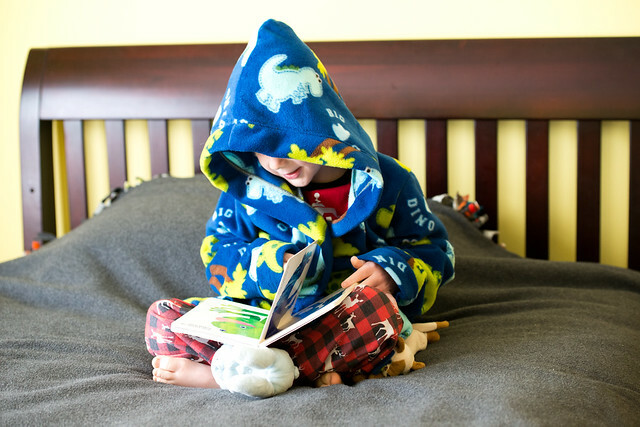 I also received the Comfy Cozy Robe pattern for free for participating in the blog tour. I love the lil long John’s from peek a boo patterns they are adorable!